Who's more valuable: Patrick Peterson or Mathieu? Published: June 29, 2016 at 09:36 a.m. 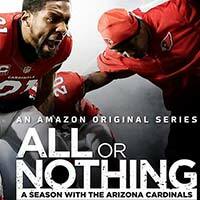 Updated: April 5, 2018 at 08:47 p.m.
Arizona Cardinals cornerback Patrick Peterson joined Tuesday's edition of the Around The NFL Podcast in anticipation of the July 1 premiere of the Amazon Prime series "All or Nothing: A Season with the Arizona Cardinals." Peterson is arguably one of the best corners in the league, but who is more valuable on the Cardinals' roster: Peterson or Tyrann Mathieu? "That's a tough question because both of us mean so much to the defense," Peterson said. "If it's not me going on the opposing team's No. 1 receiver, it's putting him in a different situation as far as blitzing, covering that No. 2 slot or No. 2 threat on the opposing team as well. But both of us, we are a great asset to the team and we want to continue doing our part to the best of our ability to hopefully get us over the top someday." The duo have been longtime teammates dating back to their days at LSU. So what gives Honey Badger that "wow factor"? "Playing with him in college I kind of saw those flashes, but when he got into the NFL on this stage and on this level: His ability to blitz, his ability to do a great job of maneuvering his body in a perfect position for some strange reason and the way he's able to turn and flip his hips as quickly as he is," he said of Mathieu. "And his ball skills, I believe, his ball skills are probably one of the best." The cornerback position has become more competitive as evidenced by the play styles of Richard Sherman, Josh Norman and Peterson -- to name a few. Peterson said it's due to the league's shift to a passing-heavy offense. "Probably have to say that because now the NFL is turning into that passing league, so most teams have marquee receivers," he added. "Now in this day and age in football, you have to have one or two marquee defensive backs or cornerbacks. To play my position, you have to be confident. I mean, you always have to carry a certain swag about yourself, and I think that's what it's all about: Just a bunch of great athletes, you know, fighting and jawing for that No. 1 spot."